Why millions of women in Kerala, India formed a 620km human wall. Why more than 3 million women in India formed a 620km human wall. Millions of women in India formed a 620km human wall this week to send a powerful message about gender equality. Earlier this week, two women sparked protests across the country’s south when they entered Hindu temple in the state of Kerala, defying a centuries-old ban on women entering. India’s Supreme Court in September ordered the lifting of the ban on women or girls of menstruating age – 10 to 50 years old – from entering the Sabarimala temple, which draws millions of worshippers a year. So it was a significant moment when the women, identified by police as Bindu Ammini, 42, and Kanaka Durga, 44, entered its walls. However not everyone agreed with the progressive change and there were protests around the state this week, AAP reports. 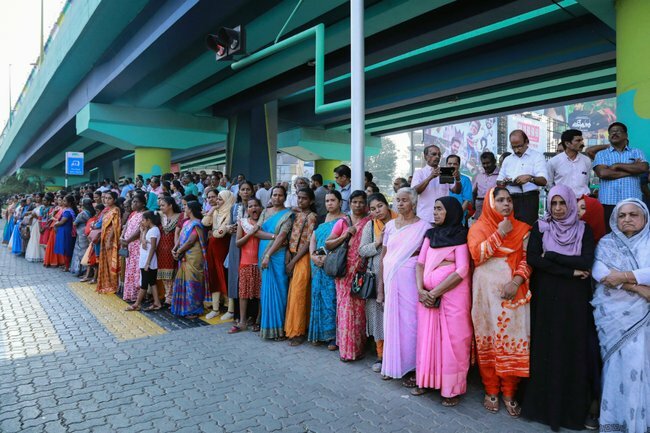 In the face of such opposition, women decided to show their support for the two women and the ban’s lifting by standing side by side to form a gigantic, 620km long human chain. The protest was organised by the state’s government and it’s been reported that at least three million and quite possibly five million women turned out. Why were women banned in the first place? The two women, had tried to go in on December 24, and later approached police for help, an officer said. “There was an elaborate arrangement for them to come just after the temple was opened early morning,” said the officer. Police were guarding the homes of the women after they left the temple and were prepared to let more women enter the temple, the officer said.